ARBITRATION NOTICE: EXCEPT IF YOU OPT-OUT AND EXCEPT FOR CERTAIN TYPES OF DISPUTES DESCRIBED IN THE ARBITRATION SECTION BELOW, YOU AGREE THAT DISPUTES BETWEEN YOU AND TWEAK & EAT WILL BE RESOLVED BY BINDING, INDIVIDUAL ARBITRATION AND YOU WAIVE YOUR RIGHT TO PARTICIPATE IN A CLASS ACTION LAWSUIT OR CLASS-WIDE ARBITRATION. You are responsible for any activity that occurs through your account and you agree you will not sell, transfer, license or assign your account, followers, username, or any account rights. With the exception of people or businesses that are expressly authorized to create accounts on behalf of their employers or clients, Tweak & Eat prohibits the creation of and you agree that you will not create an account for anyone other than yourself. You also represent that all information you provide or provided to Tweak & Eat upon registration and at all other times will be true, accurate, current and complete and you agree to update your information as necessary to maintain its truth and accuracy. You agree that you will not solicit, collect or use the login credentials of other Tweak & Eat users. You must not defame, stalk, bully, abuse, harass, threaten, impersonate or intimidate people or entities and you must not post private or confidential information via the Service, including, without limitation, your or any other person's credit card information, national identity numbers, non-public phone numbers or non-public email addresses. You must not change, modify, adapt or alter the Service or change, modify or alter another website so as to falsely imply that it is associated with the Service or Tweak & Eat. You must not create or submit unwanted email, comments, likes or other forms of commercial or harassing communications (a/k/a "spam") to any Tweak & Eat users. You must not use domain names or web URLs in your username without prior written consent from Tweak & Eat. You must not interfere or disrupt the Service or servers or networks connected to the Service, including by transmitting any worms, viruses, spyware, malware or any other code of a destructive or disruptive nature. You may not inject content or code or otherwise alter or interfere with the way any Tweak & Eat page is rendered or displayed in a user's browser or device. You must comply with Tweak & Eat's Community Guidelines, available here: http://www.tweakandeat.com/community-guidelines. We reserve the right to modify or terminate the Service or your access to the Service for any reason, without notice, at any time, and without liability to you. If we terminate your access to the Service or you request us to deactivate your account, your photos, comments, likes, friendships, and all other data will no longer be accessible through your account (e.g., users will not be able to navigate to your username and view your photos), but those materials and data may persist and appear within the Service (e.g., if your Content has been re-shared by others). You are solely responsible for your interaction with other users of the Service, whether online or offline. You agree that Tweak & Eat is not responsible or liable for the conduct of any user. Tweak & Eat reserves the right, but has no obligation, to monitor or become involved in disputes between you and other users. Exercise common sense and your best judgment when interacting with others, including when you submit or post Content or any personal or other information. There may be links from the Service, or from communications you receive from the Service, to third-party web sites or features. There may also be links to third-party web sites or features in images or comments within the Service. The Service also includes third-party content that we do not control, maintain or endorse. Functionality on the Service may also permit interactions between the Service and a third-party web site or feature, including applications that connect the Service or your profile on the Service with a third-party web site or feature. For example, the Service may include a feature that enables you to share Content from the Service or your Content with a third party, which may be publicly posted on that third party's service or application. Using this functionality typically requires you to login to your account on the third-party service and you do so at your own risk. Tweak & Eat does not control any of these third-party web services or any of their content. You expressly acknowledge and agree that Tweak & Eat is in no way responsible or liable for any such third-party services or features. YOUR CORRESPONDENCE AND BUSINESS DEALINGS WITH THIRD PARTIES FOUND THROUGH THE SERVICE ARE SOLELY BETWEEN YOU AND THE THIRD PARTY. You may choose, at your sole and absolute discretion and risk, to use applications that connect the Service or your profile on the Service with a third-party service (each, an "Application") and such Application may interact with, connect to or gather and/or pull information from and to your Service profile. By using such Applications, you acknowledge and agree to the following: (i) if you use an Application to share information, you are consenting to information about your profile on the Service being shared; (ii) your use of an Application may cause personally identifying information to be publicly disclosed and/or associated with you, even if Tweak & Eat has not itself provided such information; and (iii) your use of an Application is at your own option and risk, and you will hold the Tweak & Eat Parties (defined below) harmless for activity related to the Application. We prohibit crawling, scraping, caching or otherwise accessing any content on the Service via automated means, including but not limited to, user profiles and photos (except as may be the result of standard search engine protocols or technologies used by a search engine with Tweak & Eat's express consent). Some of the Service is supported by advertising revenue and may display advertisements and promotions, and you hereby agree that Tweak & Eat may place such advertising and promotions on the Service or on, about, or in conjunction with your Content. The manner, mode and extent of such advertising and promotions are subject to change without specific notice to you. The Service contains content owned or licensed by Tweak & Eat ("Tweak & Eat Content"). Tweak & Eat Content is protected by copyright, trademark, patent, trade secret and other laws, and, as between you and Tweak & Eat, Tweak & Eat owns and retains all rights in the Tweak & Eat Content and the Service. You will not remove, alter or conceal any copyright, trademark, service mark or other proprietary rights notices incorporated in or accompanying the Tweak & Eat Content and you will not reproduce, modify, adapt, prepare derivative works based on, perform, display, publish, distribute, transmit, broadcast, sell, license or otherwise exploit the Tweak & Eat Content. 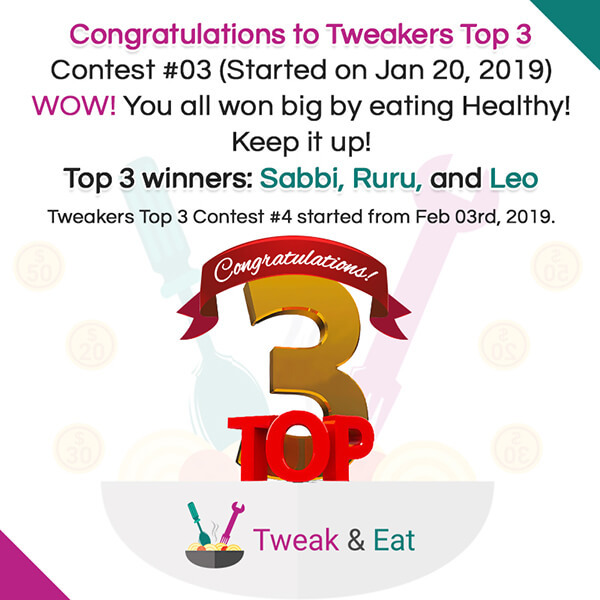 The Tweak & Eat name and logo are trademarks of Tweak & Eat, and may not be copied, imitated or used, in whole or in part, without the prior written permission of Tweak & Eat. In addition, all page headers, custom graphics, button icons and scripts are service marks, trademarks and/or trade dress of Tweak & Eat, and may not be copied, imitated or used, in whole or in part, without prior written permission from Tweak & Eat. Although it is Tweak & Eat's intention for the Service to be available as much as possible, there will be occasions when the Service may be interrupted, including, without limitation, for scheduled maintenance or upgrades, for emergency repairs, or due to failure of telecommunications links and/or equipment. Also, Tweak & Eat reserves the right to remove any Content from the Service for any reason, without prior notice. Content removed from the Service may continue to be stored by Tweak & Eat, including, without limitation, in order to comply with certain legal obligations, but may not be retrievable without a valid court order. Consequently, Tweak & Eat encourages you to maintain your own backup of your Content. In other words, Tweak & Eat is not a backup service and you agree that you will not rely on the Service for the purposes of Content backup or storage. Tweak & Eat will not be liable to you for any modification, suspension, or discontinuation of the Services, or the loss of any Content. You also acknowledge that the Internet may be subject to breaches of security and that the submission of Content or other information may not be secure. It is Tweak & Eat's policy not to accept or consider content, information, ideas, suggestions or other materials other than those we have specifically requested and to which certain specific terms, conditions and requirements may apply. This is to avoid any misunderstandings if your ideas are similar to those we have developed or are developing independently. Accordingly, Tweak & Eat does not accept unsolicited materials or ideas, and takes no responsibility for any materials or ideas so transmitted. If, despite our policy, you choose to send us content, information, ideas, suggestions, or other materials, you further agree that Tweak & Eat is free to use any such content, information, ideas, suggestions or other materials, for any purposes whatsoever, including, without limitation, developing and marketing products and services, without any liability or payment of any kind to you. THE SERVICE, INCLUDING, WITHOUT LIMITATION, TWEAK & EAT CONTENT, IS PROVIDED ON AN "AS IS", "AS AVAILABLE" AND "WITH ALL FAULTS" BASIS. TO THE FULLEST EXTENT PERMISSIBLE BY LAW, NEITHER TWEAK & EAT NOR ITS PARENT COMPANY NOR ANY OF THEIR EMPLOYEES, MANAGERS, OFFICERS OR AGENTS (COLLECTIVELY, THE "TWEAK & EAT PARTIES") MAKE ANY REPRESENTATIONS OR WARRANTIES OR ENDORSEMENTS OF ANY KIND WHATSOEVER, EXPRESS OR IMPLIED, AS TO: (A) THE SERVICE; (B) THE TWEAK & EAT CONTENT; (C) USER CONTENT; OR (D) SECURITY ASSOCIATED WITH THE TRANSMISSION OF INFORMATION TO TWEAK & EAT OR VIA THE SERVICE. IN ADDITION, THE TWEAK & EAT PARTIES HEREBY DISCLAIM ALL WARRANTIES, EXPRESS OR IMPLIED, INCLUDING, BUT NOT LIMITED TO, THE WARRANTIES OF MERCHANTABILITY, FITNESS FOR A PARTICULAR PURPOSE, NON-INFRINGEMENT, TITLE, CUSTOM, TRADE, QUIET ENJOYMENT, SYSTEM INTEGRATION AND FREEDOM FROM COMPUTER VIRUS. THE TWEAK & EAT PARTIES DO NOT ENDORSE CONTENT AND SPECIFICALLY DISCLAIM ANY RESPONSIBILITY OR LIABILITY TO ANY PERSON OR ENTITY FOR ANY LOSS, DAMAGE (WHETHER ACTUAL, CONSEQUENTIAL, PUNITIVE OR OTHERWISE), INJURY, CLAIM, LIABILITY OR OTHER CAUSE OF ANY KIND OR CHARACTER BASED UPON OR RESULTING FROM ANY CONTENT. UNDER NO CIRCUMSTANCES WILL THE TWEAK & EAT PARTIES BE LIABLE TO YOU FOR ANY LOSS OR DAMAGES OF ANY KIND (INCLUDING, WITHOUT LIMITATION, FOR ANY DIRECT, INDIRECT, ECONOMIC, EXEMPLARY, SPECIAL, PUNITIVE, INCIDENTAL OR CONSEQUENTIAL LOSSES OR DAMAGES) THAT ARE DIRECTLY OR INDIRECTLY RELATED TO: (A) THE SERVICE; (B) THE TWEAK & EAT CONTENT; (C) USER CONTENT; (D) YOUR USE OF, INABILITY TO USE, OR THE PERFORMANCE OF THE SERVICE; (E) ANY ACTION TAKEN IN CONNECTION WITH AN INVESTIGATION BY THE TWEAK & EAT PARTIES OR LAW ENFORCEMENT AUTHORITIES REGARDING YOUR OR ANY OTHER PARTY'S USE OF THE SERVICE; (F) ANY ACTION TAKEN IN CONNECTION WITH COPYRIGHT OR OTHER INTELLECTUAL PROPERTY OWNERS; (G) ANY ERRORS OR OMISSIONS IN THE SERVICE'S OPERATION; OR (H) ANY DAMAGE TO ANY USER'S COMPUTER, MOBILE DEVICE, OR OTHER EQUIPMENT OR TECHNOLOGY INCLUDING, WITHOUT LIMITATION, DAMAGE FROM ANY SECURITY BREACH OR FROM ANY VIRUS, BUGS, TAMPERING, FRAUD, ERROR, OMISSION, INTERRUPTION, DEFECT, DELAY IN OPERATION OR TRANSMISSION, COMPUTER LINE OR NETWORK FAILURE OR ANY OTHER TECHNICAL OR OTHER MALFUNCTION, INCLUDING, WITHOUT LIMITATION, DAMAGES FOR LOST PROFITS, LOSS OF GOODWILL, LOSS OF DATA, WORK STOPPAGE, ACCURACY OF RESULTS, OR COMPUTER FAILURE OR MALFUNCTION, EVEN IF FORESEEABLE OR EVEN IF THE TWEAK & EAT PARTIES HAVE BEEN ADVISED OF OR SHOULD HAVE KNOWN OF THE POSSIBILITY OF SUCH DAMAGES, WHETHER IN AN ACTION OF CONTRACT, NEGLIGENCE, STRICT LIABILITY OR TORT (INCLUDING, WITHOUT LIMITATION, WHETHER CAUSED IN WHOLE OR IN PART BY NEGLIGENCE, ACTS OF GOD, TELECOMMUNICATIONS FAILURE, OR THEFT OR DESTRUCTION OF THE SERVICE). IN NO EVENT WILL THE TWEAK & EAT PARTIES BE LIABLE TO YOU OR ANYONE ELSE FOR LOSS, DAMAGE OR INJURY, INCLUDING, WITHOUT LIMITATION, DEATH OR PERSONAL INJURY. SOME STATES DO NOT ALLOW THE EXCLUSION OR LIMITATION OF INCIDENTAL OR CONSEQUENTIAL DAMAGES, SO THE ABOVE LIMITATION OR EXCLUSION MAY NOT APPLY TO YOU. IN NO EVENT WILL THE TWEAK & EAT PARTIES TOTAL LIABILITY TO YOU FOR ALL DAMAGES, LOSSES OR CAUSES OR ACTION EXCEED ONE HUNDRED UNITED STATES DOLLARS ($100.00). YOU AGREE THAT IN THE EVENT YOU INCUR ANY DAMAGES, LOSSES OR INJURIES THAT ARISE OUT OF TWEAK & EAT'S ACTS OR OMISSIONS, THE DAMAGES, IF ANY, CAUSED TO YOU ARE NOT IRREPARABLE OR SUFFICIENT TO ENTITLE YOU TO AN INJUNCTION PREVENTING ANY EXPLOITATION OF ANY WEB SITE, SERVICE, PROPERTY, PRODUCT OR OTHER CONTENT OWNED OR CONTROLLED BY THE TWEAK & EAT PARTIES, AND YOU WILL HAVE NO RIGHTS TO ENJOIN OR RESTRAIN THE DEVELOPMENT, PRODUCTION, DISTRIBUTION, ADVERTISING, EXHIBITION OR EXPLOITATION OF ANY WEB SITE, PROPERTY, PRODUCT, SERVICE, OR OTHER CONTENT OWNED OR CONTROLLED BY THE TWEAK & EAT PARTIES. TWEAK & EAT IS NOT RESPONSIBLE FOR THE ACTIONS, CONTENT, INFORMATION, OR DATA OF THIRD PARTIES, AND YOU RELEASE US, OUR DIRECTORS, OFFICERS, EMPLOYEES, AND AGENTS FROM ANY CLAIMS AND DAMAGES, KNOWN AND UNKNOWN, ARISING OUT OF OR IN ANY WAY CONNECTED WITH ANY CLAIM YOU HAVE AGAINST ANY SUCH THIRD PARTIES. PurpleTeal, Inc., 48873 Semillon Drive, Fremont CA 94539, USA. You must include your name and residence address, the email address you use for your Tweak & Eat account, and a clear statement that you want to opt out of this arbitration agreement. If the prohibition against class actions and other claims brought on behalf of third parties contained above is found to be unenforceable, then all of the preceding language in this Arbitration section will be null and void. This arbitration agreement will survive the termination of your relationship with Tweak & Eat. You agree that any claim you may have arising out of or related to your relationship with Tweak & Eat must be filed within one year after such claim arose; otherwise, your claim is permanently barred. The information provided within the Service is not intended for distribution to or use by any person or entity in any jurisdiction or country where such distribution or use would be contrary to law or regulation or which would subject Tweak & Eat to any registration requirement within such jurisdiction or country. We reserve the right to limit the availability of the Service or any portion of the Service, to any person, geographic area, or jurisdiction, at any time and in our sole discretion, and to limit the quantities of any content, program, product, service or other feature that Tweak & Eat provides.